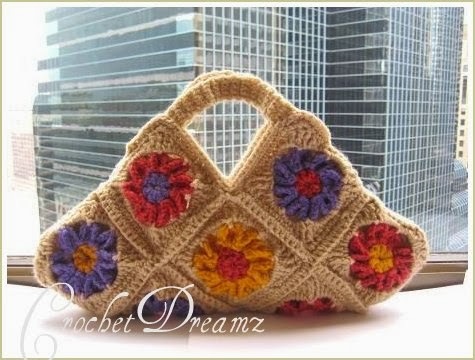 This bag would make an amazing Spring or Summer accessory. It’s just a little bigger than a normal clutch and would go well with any dress. 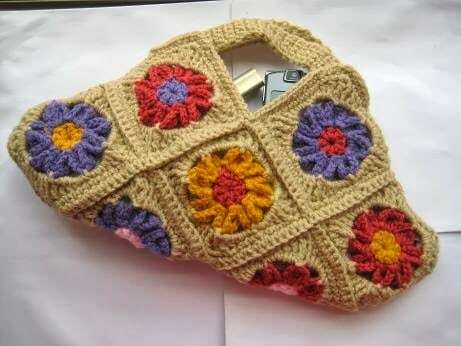 This crochet pattern uses granny squares which are then joined together to create the unique shape of the bag. I have decided to make it free for my blog readers. The dimensions of the completed bag are 15 inches at the widest part and 9 1/2 inches from top of the handle to bottom of the bag. It’s worked using worsted weight yarn in 5 different colors and a size H (5 mm) crochet hook. I used Red Heart Super Saver and Vanna’s choice for the bag in the picture. 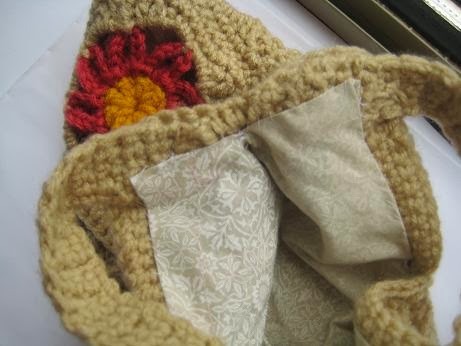 Pattern includes instructions for lining the bag as well. This looks so different from other granny bags. Great shape too! Patterns should be free especially if the other person on the other end is printing it out. I'd only pay money if the creator was mailing out a printed copy. Designers take a lot of time to use their creativity to not only design items but to type the pattern, provide tutorials, take photos, edit pictures and post them and even have testers check the patterns for errors. It is not a quick process! Ignorant sentiments like this are destroying this craft by devaluing the work of creative designers, many of whom are doing this as a part time hobby. Free patterns are available because of the generosity of the designers, becuase they are able to be off-set their cost in other ways. They should be GREATLY appreciated NOT expected. No one should be made to feel bad because they charge a very nominal fee to compensate them for their time and work. You wouldn't dream of asking an architect, interior designer or any other creative profesional to work for free and give away their work product for free, would you? I'm sure whoever wrote this thoughtless comment will never read this, but maybe someone else that feels the same way will and we can turn the tide of this ignorant ungrateful sentiment. This is such a unique bag! I would love if you linked up to my new fiber arts link party! It's perfect for us crochet peeps.